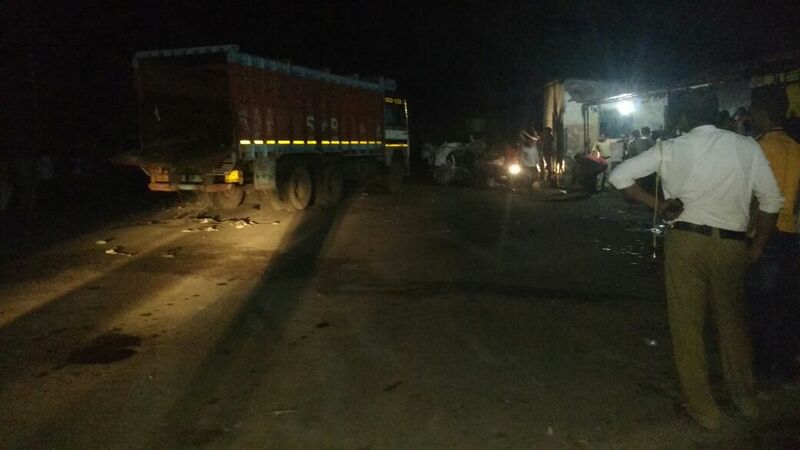 In a shocking escape attempt by a cow smuggler in Amravati, Maharashtra, a family of 3 were killed and more than 40 people injured, when he drove his truck on high speed hitting at least 12 cars from Warud to Chandur Bazar, while trying to escape police on 21st July. In what seems like a smaller version of the Nice jihadi attack in France, though for a different purpose, this truck driver too kept on driving recklessly for a distance of about 65 kilometers, beginning from breaking the police barricades in Warud, before finally getting caught. His accomplice too has been arrested – the police has not revealed their names yet. 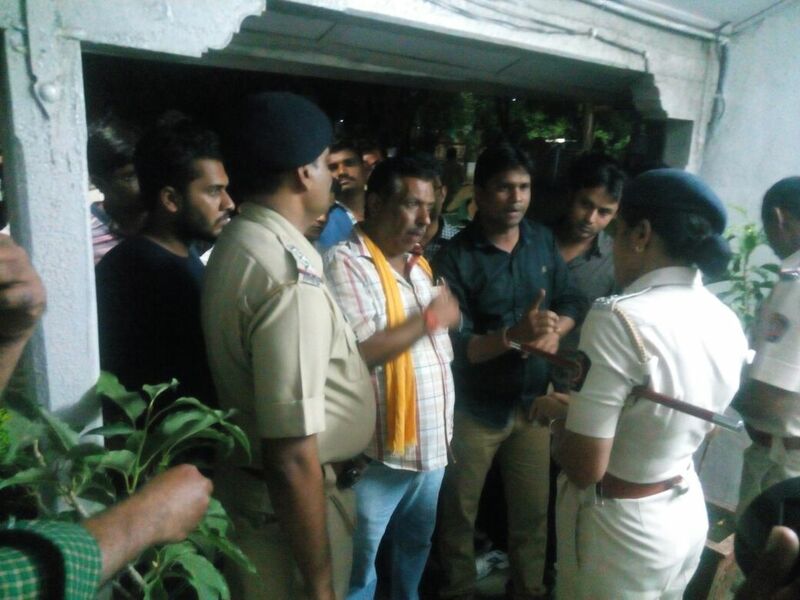 The police force was tipped off by gau rakshaks (cow protection volunteers) who decided not to take the matter in their own hands but informed the police. At the time of writing this article, there is not even a single news report in English mainstream media about this incident. The 3 killed were all members of the same family: husband, wife and their 3 year old child. 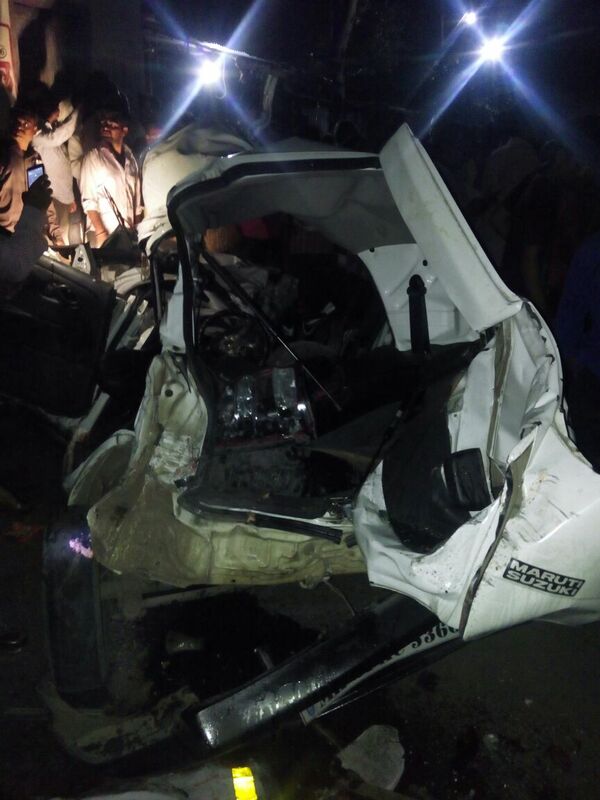 One young girl sitting in the same car is critically injured and struggling for her life in ICU. 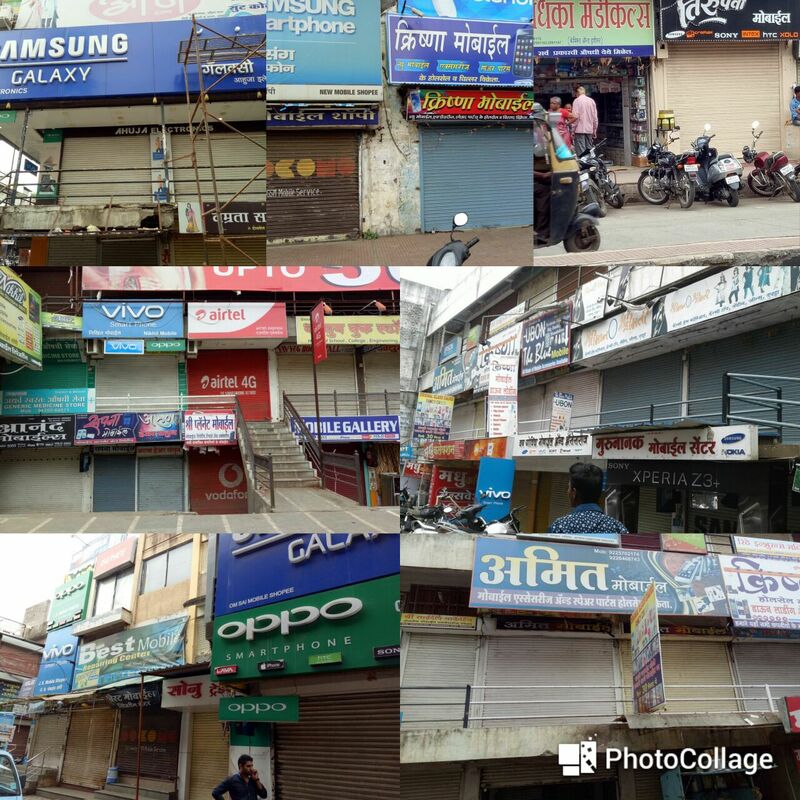 The general population of Hindus in Amravati was furious over the loss of lives and severe damage to property and had come out on roads to protest when some policemen even did a lathi charge on them to clear the protesters. 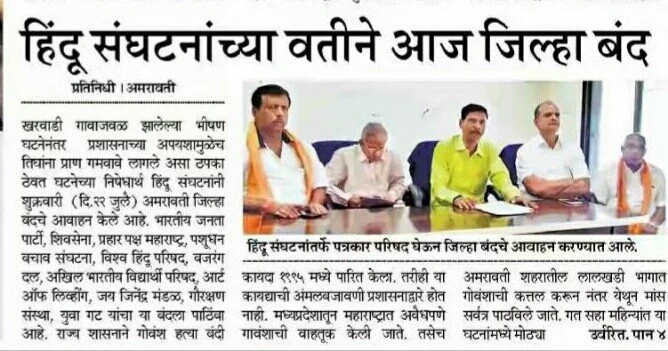 Hindupost talked to those on the ground and it seems that Mr. Vijay Sharma, VHP Vidarbha State Gau Raksha Pramukh, had already submitted 3 applications to district authorities this year requesting them to control rampant cow smuggling, specially the trucks that come from Madhya Pradesh. 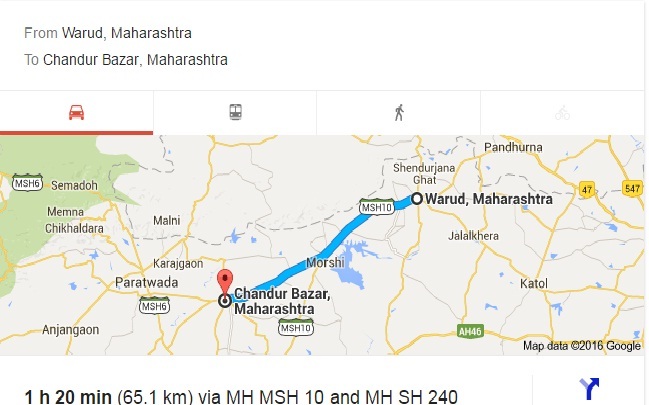 The smuggling is for slaughtering purpose which is illegal in Maharshtra and against the Directive Principles of the Constitution of Bharat. While simple cases of what most media and elites term as ‘Cow Vigilantism’ are quickly covered and repeatedly telecast in mainstream English media, a grave incident such as the above in Amravati has not seen any space in English channels/dailies. Most media is quick to term the cow smugglers/drivers of such vehicles as ‘beef transporters’ like in the recent case of 2 such men who were indeed found carrying 300 kilos of beef in their car by gau rakshaks. Beef trade is illegal in Haryana, as it is in 24 out of 29 states of Bharat, and a laboratory test confirmed that the 300 kilos of meat found in this case was indeed beef. These 2 smugglers were arrested by police on June 10, but most media still chose to call them as ‘beef transporters’. In another recent incident, Muslim cow smugglers with multiple criminal cases on them had shot 2 cow protection volunteers in Haryana, injuring them seriously. 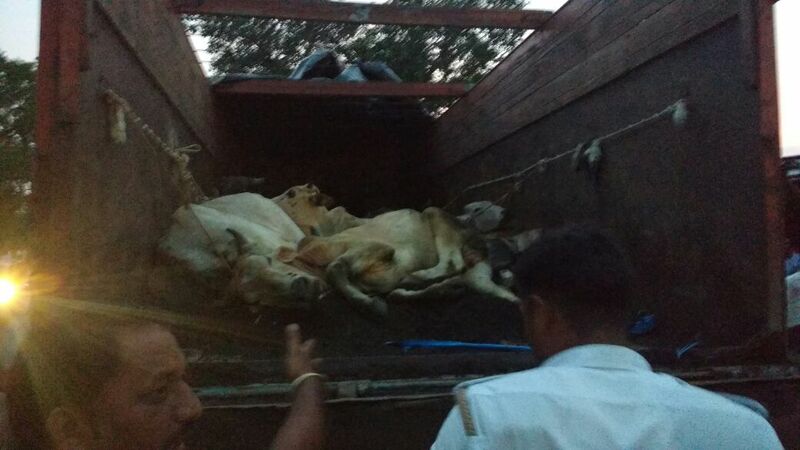 The news brought to light the fact that genuine cow protection volunteers suffer serious risks for this Dharmic cause which is also consistent with our laws and Constitution, besides being a serious animal rights issue seeing the grotesque torture cattle suffer in this illegal trade. Moreover, for the skeptics, there is incontrovertible scientific evidence regarding the damaging effect of beef (cow meat) for human health and the environment. It is important to differentiate that while cow slaughter and beef trade is illegal in most of Bharat, it is legal to skin dead cows to produce leather, and there are many traditional communities in Bharat which make a living through this. A genuine gau rakshak knows this difference, and respects it.English media and Adarsh Liberals prefer to gloss over this crucial fact; conflating the two separate issues of cow slaughter for beef and skinning of dead cows for leather makes their job of demonizing Hindus and dismissing all anti-cow slaughter volunteers as violent vigilantes, much easier. The more recent incident of ‘Cow Vigilantism’ in Una, Gujarat (which happens to be a Congress stronghold within Gujarat) raises many concerns and seems like a well-thought out strategy in the wake of approaching UP elections. The shocking observations which establish that this incident could well be a set up by ‘secular’ parties are covered in this write up. No Hindu in their sane mind would assault Dalits for skinning dead cows, specially when this is their profession since generations. 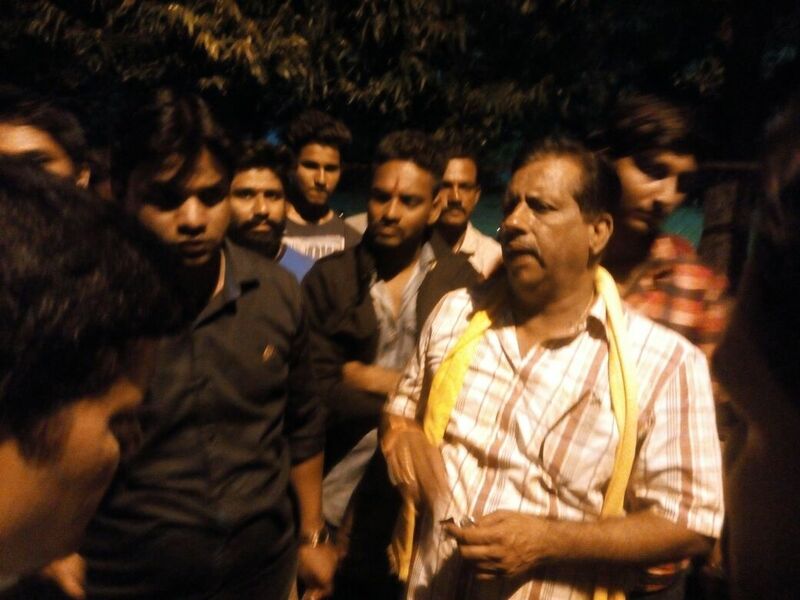 The perpetrators were Darbar by caste and a form a strong group in Gujarat Congress. 3 of the 4 perpetrators and 3 of the 4 suspended negligent cops in the Una violence against Dalits incidence are Darbars. A cop even died in the violence perpetuated by ‘protesters’ post the incident. The orchestrated manner of protests in Gujarat, the synchronized outcry across media, and the outbreak of op-eds and articles forecasting the political impact of this incident on UP elections, all hint at a well-planned political campaign to divide Hindus. OK this is official. Dalits beaten/persecuted will be THE narrative till UP elections. MSM has ‘discovered’ Dalits. Coming back to the Amravati incident, millions of Bharatiya citizens expect the Maharashtra and MP governments to not leave any stone unturned in bringing down the entire cow smuggling mafia.